The lecture took place on Thursday 15th of November at 7:00 p.m. in the “Old Electrical Company” of Paphos and was organized by the School of Law and the Post-Graduate Programs of History at the University of Neapolis in collaboration with the Paphos Bar Association. 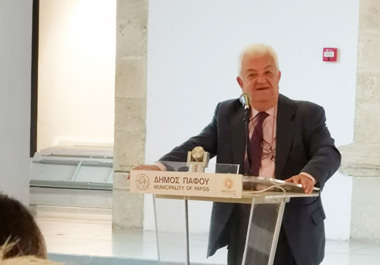 The invited guest speaker was Professor Evangelos Chrysos, Emeritus Professor of Byzantine History at the University of Athens and former General Secretary of the Hellenic Parliament Foundation. The title of the lecture was: The physiognomy of Medieval Cyprus, with reference to its administrative organization and its legal establishment. Professor Chrysos presented the portrait of Cyprus during the early phase of Frankish rule of the Lusignan dynasty, starting from the period of the conquest of King Richard I of England -the Lionhearted- (1191) until the end of the 14th century, based on references from the Latin-western and Byzantine texts of the period. He noted the role and position of medieval Cyprus when the Crusaders begun to arrived in the Middle East during the 11th century. He also analyzed the contents of two Cypriot manuscripts of the 14th century (from the “Agia Moni” monastery in Paphos) which are now kept in the Vatican Library and the National Library of Paris, that include collections of texts which demonstrate the course of legal relations between the Greek Orthodox and Roman Catholic element of Cyprus. These texts depict the way courts were organized, the daily operation of justice and the social trends that influenced the administration of justice in 14th century Cyprus. At the end of his lecture, Professor Chrysos pointed out that despite the isolation of Cyprus from the Byzantine Empire, the legal framework that applied to the legal tradition of the island, was parallel and corresponding to the legal reality of the same period in the area of Thessaloniki, as this is demonstrated in the Hexabiblos of Constantine Armenopoulos. The presentation was saluted by the President of the Law School of Neapolis University, Professor Konstantinos Athanasopoulos, the director of Post-Graduate Studies in History, Professor of Modern History Giorgos Georgis and the President of the Paphos Bar Association, Mr. Epaminondas Korakides. The presentation was organized by Dr. Artemis Savvidou on behalf of the Law School, who also presented the program and by Dr. Katerina Papazacharia on behalf of the Post-Graduate Studies in History Program, who also introduced the speaker.